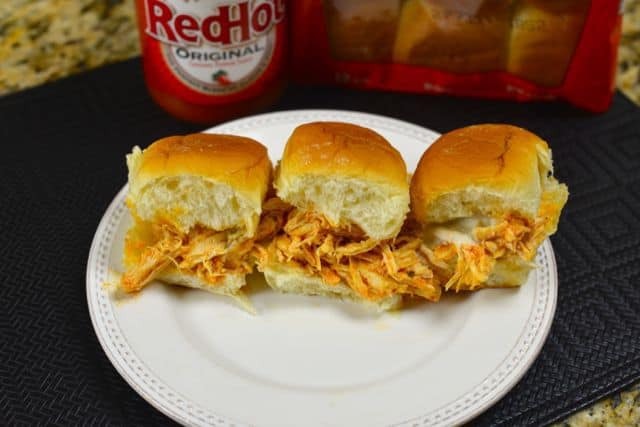 Buffalo chicken sliders are perfect for your game day. These are so easy to make too. All of the goodness of a hot wing, but you don’t have to get your fingers dirty. You don’t need a game to enjoy these; they are ready for you any day of the week. Seriously, who doesn’t love buffalo chicken wings? It is one of my favorite ways to serve up chicken. This recipe is very straightforward, and I am going to use my pressure cooker for this recipe. I love my pressure cooker it makes cooking simple, and very clean. You can make this dish in about 30 minutes with your pressure cooker. If you don’t happen to have one, you can use a slow cooker, either way they will come out great. I will actually give you both instructions for using a pressure cooker for this recipe as well as a slow cooker. Pressure cookers allow you to cook a recipe in a much shorter time, and with the electric ones that are available now days they are easy to use. I know not everyone has a pressure cooker, but slow cookers work well too. I give you the instructions for those too. I am using Hawaiian bread rolls for these sandwiches, I like the sweeter bread with the spicy chicken. I personally love Frank’s Red Hot Sauce, I am never without it in my pantry, and no, I am not sponsored by these folks. I like their sauce because its hot but not explosively hot, and it has a nice depth of flavor. So often hot sauces are naturally spicy and they don’t taste good. I am also using dry Ranch dressing mix, I buy mine in bulk at Costco, it’s much cheaper that way, I also like to use it in my No Time Taco Soup recipe. You may want to cook these ahead of time, and place this in a slow cooker for your game day and let your guests assemble their own sliders. You may want to have jars of salad dressing (Ranch or Blue Cheese), tomato slides, lettuce, and maybe even some thin onion slices to go along with these sandwiches. You could also split open the buns smear a little butter on them, and toast them for an extra touch. Love the buffalo chicken flavor? Check out these recipes. It's hard to beat Buffalo Chicken Sliders. Buffalo chicken is made in your crockpot. Pressure Cooker directions Place two pounds of chicken, 12 ounces of hot sauce, 1/2 cup butter, dry Ranch dressing mix into the pressure cooker, set the timer to 30 minutes. 30 minutes for chicken is way too long in an Ip. I just did 10 with 4 min NPR and it was perfect. Used 1 cup water and half the buffalo sauce. Added the rest of sauce after shredding. Are you supposed to put water in the pressure cooker which is what you normally do? I did not add any additional water to the pressure cooker. I think created a more of a steaming process under pressure. Do you recommend the regular Franks or the Franks “buffalo”? I always go with their regular.